It's not often you supply food to an island of indigenous people who actually need it. And by "actually," we mean that even a home full of fifteen orphans did not have anything to eat last Saturday the 19th until eight Girl Scouts and their two instructors arrived with bags of food. Two weekends ago, Girl Scouts Underwater Explorers students - with their Costa Rica Outward Bound instructors Mariana and Erin - completed a meaningful service project in Panama. "It's amazing that people live that way.... maybe we shouldn't complain as much as we do about small stuff," one of the Girl Scouts reflected after completing the project. 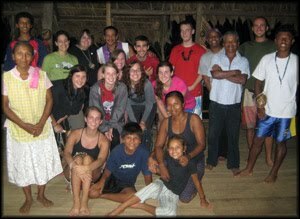 The group packed bags of food (including rice and lentils) at our base camp on Isla Solarte located in the Bocas del Toro archipelago. After spending 1-2 hours organizing hundreds of food packets, they took a boat taxi to Tierras Obscuras (meaning "dark lands") to deliver them to homes and schools. This is when they met the woman with fifteen hungry orphans. They also met some of the locals and observed the classroom settings. It had a profound effect on them, and they spent the afternoon discussing it. This will not be the end of our community service in this region. When other Costa Rica Outward Bound courses head to Panama this summer, we hope to help by supplying fresh water to some of the islands. Scott Brown, our Associate Program Director, has been coordinating projects with Operation Safe Drinking Water which organizes projects for delivering water tanks and building fresh drinking water systems in areas where inhabitants are drinking dirty water and getting sick. Students' jobs will be to help install rain catchment tanks for indigenous schools and villages in order to catch, store and share the pure rainfall. We are excited to have found another way to integrate Community & Service, one of our core value elements, into the courses' Panama Phases. Pura vida! "Wait... you're in Costa Rica right now? Oh, how cool!" This is a common reaction to parents and students that talk to us on the phone. 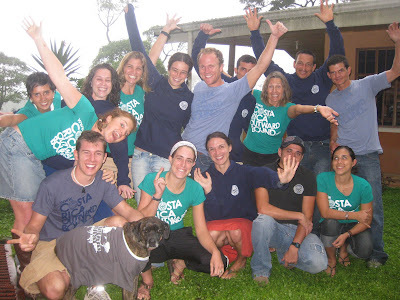 Base is a frequent term in our Costa Rica Outward Bound vocabulary. 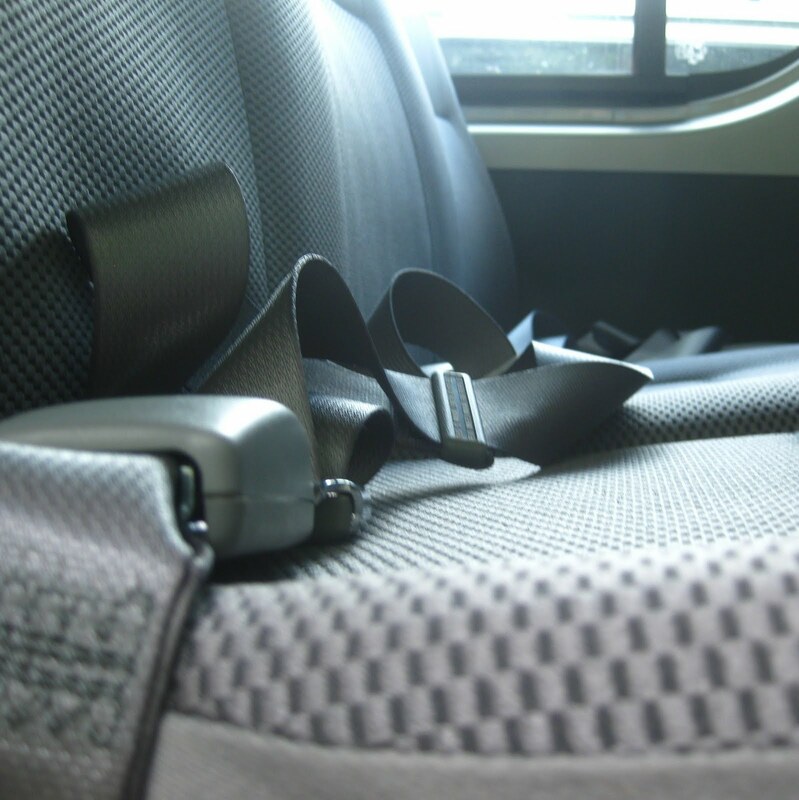 But based on some comments from students and parents, we gather that its purpose, function, description, and location are not as clear as we think. Base is our rainforest "campus" that contains our homes (for the base staff), our offices, the kitchens, the student and instructor dorms, and our equipment bodega. It has been our hub since 2002, the year the communications staff left our Manuel Antonio base (bought in 1995). (Click here to view photos of both bases on our flickr.com "base" tags.) Students' sleep at this base (located in the outskirts of San Jose) on their first and final nights, during Transition Days*, and the nights before rafting trips (those in Central Valley rivers). "500m northeast of the last bus stop of San Ramon de Tres Rios; the first right-hand gate after the fourth speed bump." Sketchy? Yeah, we think so, too, but that's the nature of Costa Rican addresses. There are no street names or numbers. Waterfall rappelling is easily one of the most photographed activities we have here at Costa Rica Outward Bound. When editors of local newspapers decide to publish something about one of our alumni in their "Hometown Heroes" sections, they will inevitably choose the photo of the student waterfall rappelling over any others we submit. 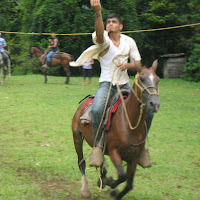 This activity mixes both a true challenge with a defining beauty mark of Costa Rica, the waterfall. It's only natural that students love getting photos from the day they rappelled in a Costa Rican rainforest amidst rushing water. But in the moment students are about to descend, their emotions aren't as "beautiful" as the photos being taken of them. Most times groups consist of 7-15 students. Therefore, the wait at the top for others to descend in front of you one-by-one can be quite nerve-wracking. Especially as a first-timer, you try to pay close attention - over the loud rushing water, of course - to the instructors who are repetatively teaching the technique to each student ready to begin rappelling. After the final step, students walk away jubilated. It is a strong adrenaline rush, and it definitely accomplishes Kurt Hahn's founding mission when he started Outward Bound in 1941: "to instill confidence, tenacity, perseverance and to build experience through overcoming challenging conditions." That, and you look good. So, you thought you were coordinated? Give this PB sport a try. "PB," as in, our favorite little village of Piedras Blancas. 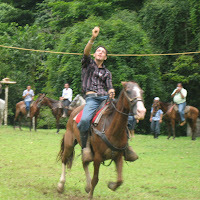 And "sport," as in, Carreras de Cintas in which athletes stick a peg through a tiny hanging ring while on a horse. Inevitably, you have been one of the Costa Rica Outward Bound students or staff who have been to PB's adorable remote school (of 3-10 students) to paint, play soccer, meet the kids, deliver books, cook, and/or help in its organic garden while staying at one of PB's homestays. It has a special place in all of our hearts. For this reason, PB takes any opportunity to fundraise and keep it going for many years to come. So when the school's 15th anniversary happened this past May, Piedras Blancas civilians and their vecinos (from the towns of Brujo, Llano, and San Isidro) took advantage of the event by throwing a party, during which they sold Tico food and played games with entry fees. 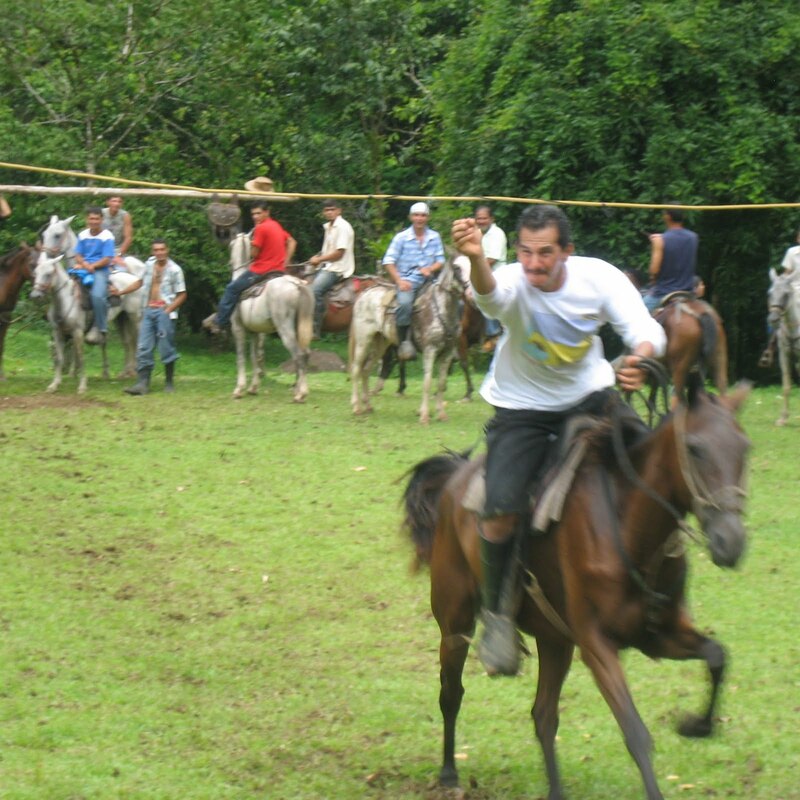 In Piedras Blancas' tournament, there were eighteen men who entered, each paying ₡6,000 (CRC, Costa Rica Colones). Twenty premios (prizes) were awarded, one handed out to each of the first twenty "belt captures" - the contestants began in a line to make their attempts, then tried one at a time. After each attempt they got back in line to do it again until all twenty prizes (horse supplies) had been awarded. In addition to the twenty prizes, a ₡10,000 award was given to the winner of the primary tournament. This consisted of levels, during which each contestant ran twice. All of those who captured the belt both times moved to the next level. The remaining contestant in the final level won the money. We already had a held our Tico village friends in high regard, but putting a tiny peg through a tiny ring while galloping on a horse adds a whole new level of respect. This is one sport we would like to see added to the Olympic Games. "Do you recommend that I bring a mosquito net?" This easily falls in our top ten most frequently-asked packing list questions, so it's about time that we answered it in a public setting. This also leads us to explain another "optional" packing list item, the hammock. The quick answer: you can come without both. 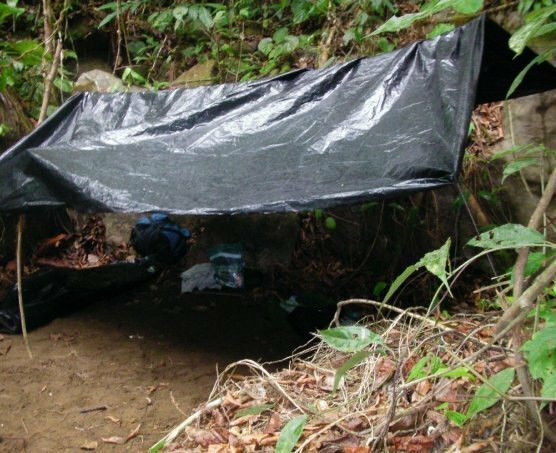 Although tarps and some homestays do not provide enclosed protection against "flying critters," these locations [where such sleeping facilities are provided] are not heavily populated with mosquitoes. Rainforest conditions are not ideal for them, and they tend to inhabit the coasts. At these beach locations, our students sleep in either our Manuel Antonio base or tents. Both provide sufficient protection from mosquitoes. 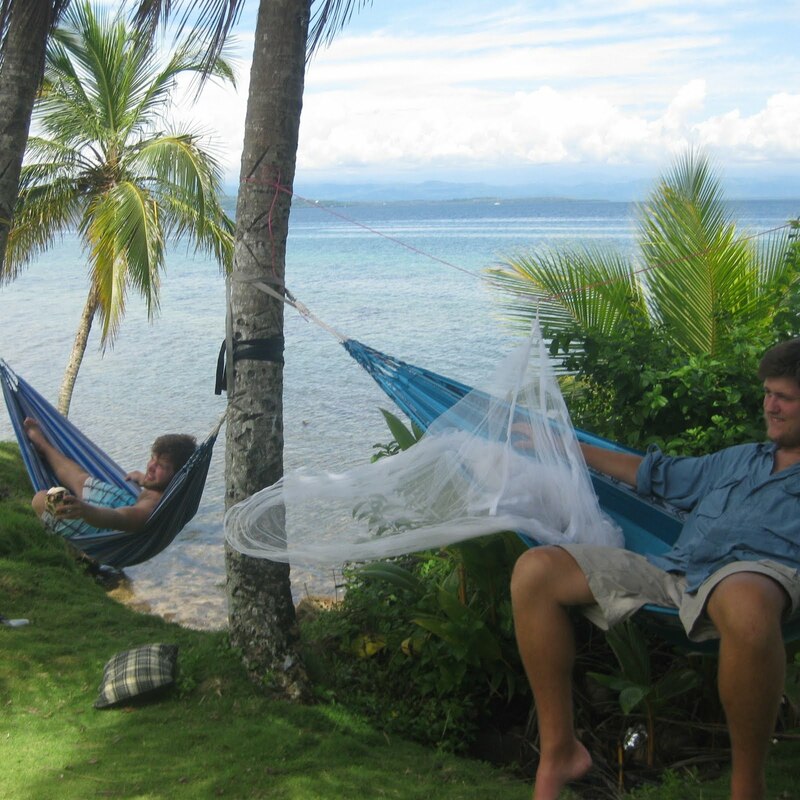 However, in these same beach locations, some students opt to sleep outside in either a hammock (as shown in these Solarte, Panama photos of Leadership students who set up hammocks, both in our kitchen hut and out among the trees) or on a z-rest*. The reason being, the warm coastal climate can create an uncomfortable warm tent, and some students prefer to be outdoors which may provide more of a breeze. In these cases, we do recommend a mosquito net . Overall, the bugs are not bad, but they can come in unexpected waves. Hammocks: This is a personal preference (based on sleeping on it and transporting it), but keep in mind that you will have to work with your unpredictable surroundings to set it up. 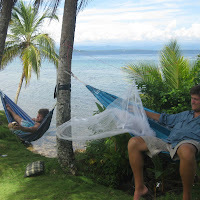 (Read "How to Set Up a Hammock" article to familiarize yourself with the process.) 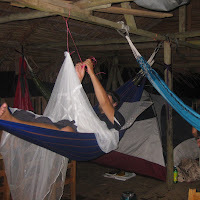 Also, there are hammocks you can purchase with mosquito nets built on them. You can find these at some outdoor retailers. Mosquito nets: Purchasing them isn't too complicated. Find something that you can hang on a branch or rope over your hammock or z-rest. Torpos can also be found at outdoor retailers. Well, we finally did it. When Scott returned from a seven-day cat-and-mouse journey in Panama last week, we knew it meant one thing: the new van finally arrived. "Nowhere are the differences between Central America and North America more evident than in the navigation of law, bureaucracy and borders." In short: it wasn't easy. 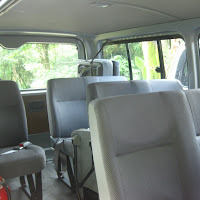 Step 1: Research a safe and roomy van to transport our students around Costa Rica. 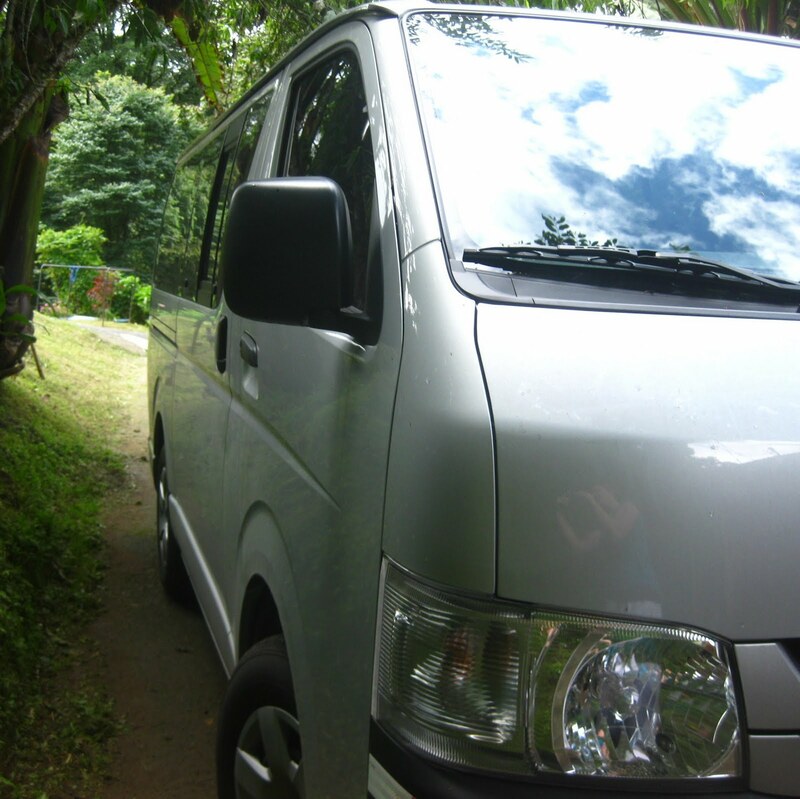 Jim Rowe, our Executive Director, found the Toyota Hiace. 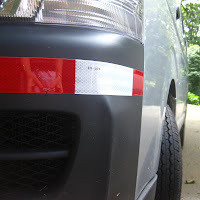 Step 2: Find a dealership selling the it. 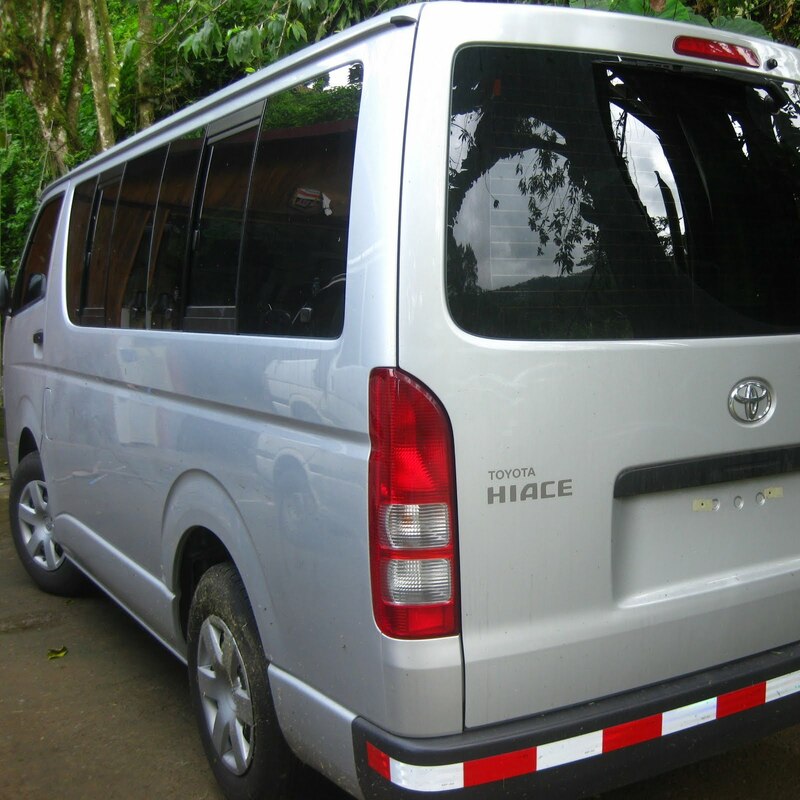 Costa Rica was sold out of the 2010 model, so Jim turned to a dealership in David, Panama. Step 3: Jim spent a week in Panama negotiating the purchase of the brand new vehicle. The dealership agreed to do all of the paperwork necessary to bring the van across the border to Costa Rica. Step 4: A month later, Scott Brown, our Associate Program Director, flew to Panama to pick up the van, expecting a seemless transaction to bring it back to our San Jose base. He forgot he was in Central America. Step 5: Surprisingly, the dealership did not have the legal certification of ownership they promised - they gave him a "Bill of Sale" to use at the border instead because "that should work." Step 6: After a 1.5-hour drive to the border, Scott learns his documentation is worth the same as a stack of Post-Its, and he must wait until Monday when the "official" transit office is open for proper documentation. Step 7: Scott spends a weekend in some sketchy hotels. Step 8: Monday morning - Scott obtains a "document of certification" from the transit office. Step 9: Monday afternoon - the border patrol again tells Scott his documentation is worth nothin. Step 10: Tuesday morning - Scott returns to the transit office where he informs them of their incorrect documentation. Their response: he can not receive the documents the border requested because Scott is neither Panamanian nor Costa Rican. His next step was acquire a "re-exportation" form that includes a Bill of Sale. This will help the border people properly tax Scott with duty fees. Step 11: Tuesday mid-day - Scott arrives at a lawyer's office where he is told to pay a lot of money for the lawyer to make four copies of the necessary documentation. Step 12: Tuesday afternoon - Scott arrives at the border, and they allow him to leave Panama. But Costa Rica (and a train of six locals trying to "help") wouldn't let him enter without speaking to (and paying for) a border lawyer for more "documents." Step 13: Scott ignores them and checks into a dodgy Panamanian hotel for the night. Step 14: Wednesday morning - Scott makes it to the border very early to avoid the border people (who had been complicating the situation). Costa Rica allows Scott - and the van - to enter. He drives five hours back to base. Step 15: Costa Rica Outward Bound drops the van off at a type of "quarantine" holding center (called Almecen Fiscal) where Costa Rican officials kept it for a few days to perform a full legal inspection. 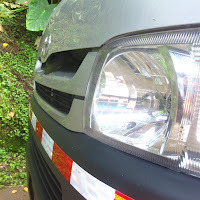 Step 16: Costa Rica Outward Bound sent the car to the Reteve for a thorough mechanic inspection... twice. And now, after the month of headaches to acquire this shiny new eye candy for our base, we are almost ready to use it for the Busy Season. 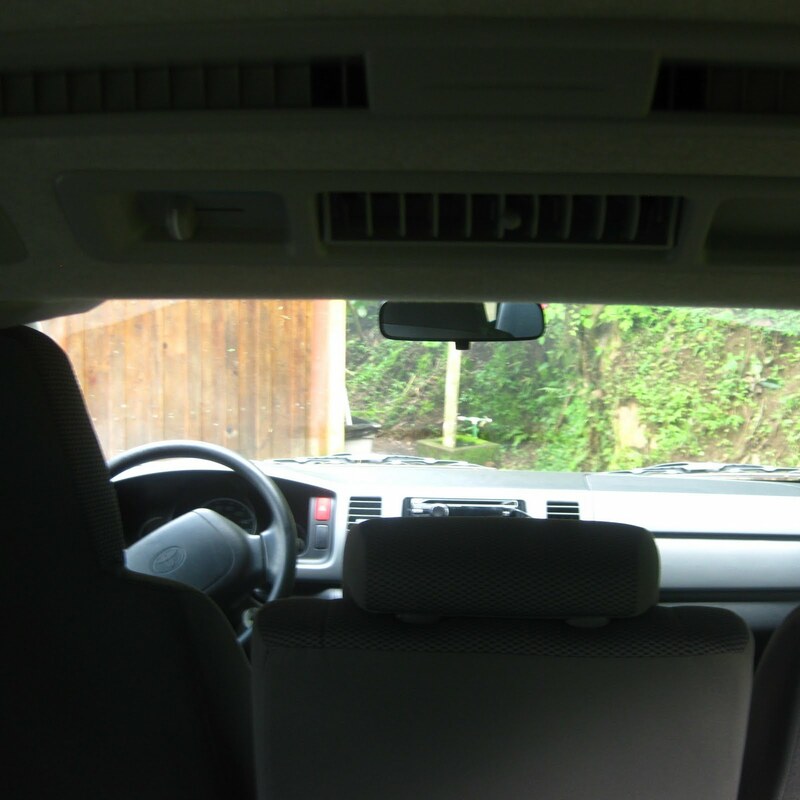 But until then, we can stick our heads into it a few times a day to appreciate that new car smell. 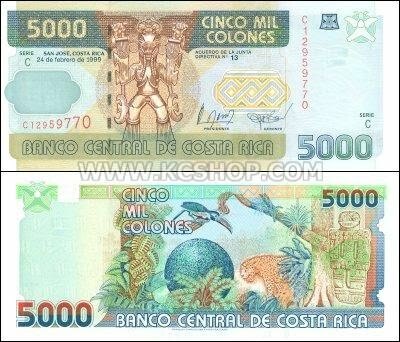 One of the many great parts of traveling abroad is checking out new currency, and Costa Rican money is no disappointment. With volcanoes, sharks, and jaguars and vibrant colors, the bills are full of Costa Rica´s natural wonders. Costa Rican currency is the colón (plural is colónes), with the symbol ₡. This is named after Christopher Colombus (Cristoból Colón in Spanish). The exchange rate is currently ₡534= $1. Therefore, it is not unusual to have a few ₡10,000 bills in your wallet (₡10,000 =$19). In addition to the four bills, there are also six coins, which range from ₡5 to ₡500. 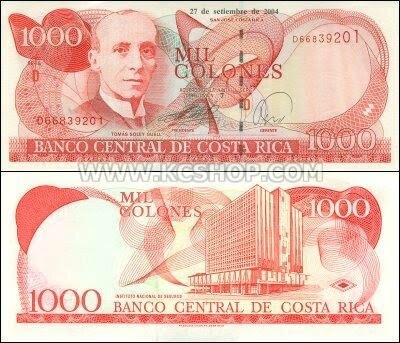 The ₡1,000 bill is called ¨un rojo¨ due to its red color. It showcases Tomas Soley Guell, Costa Rica´s President from 1932-1982. Also on the bill is the National Insurance Institute, a state run insurance company founded by Guell. 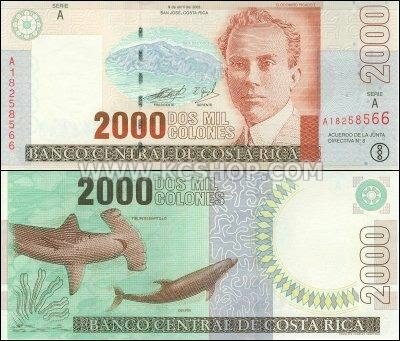 The ₡2,000 bill shows Clorito Picado, a scientist who was a pioneer in researching snake venom, and also conducted research that led to the discovery of penicillin. On the other side of the bill is the hammerhead shark and the bottlenose dolphin, two animals that are found on Costa Rica´s Isla del Coco. 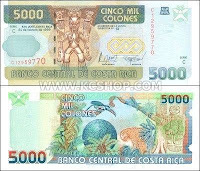 The ₡5,000 bill is often known as a ¨túcan¨, based on the the 3 toucans hidden among images of a rainforest with a jaguar, bromeliad flowers, and precolumbian sculptures. 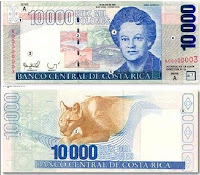 The ₡10,000 bill features Emma Gamboa, a teacher who helped to found the University of Costa Rica´s School of Education. There are also four volcanoes on the front (Arenal, Poás, Irazú, and Rincón de la Vieja). 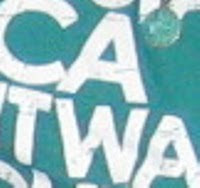 The back has a puma, along with a face of a jaguar. Under ultraviolet light, different parts of bills turn red and green, and blue and yellow dots appear. The blind can recognize some bills by the raised geometric figure on the bottom right of the bills. New currency should be coming out this year, and bills will all be different lengths so that the blind can easily differentiate bills. 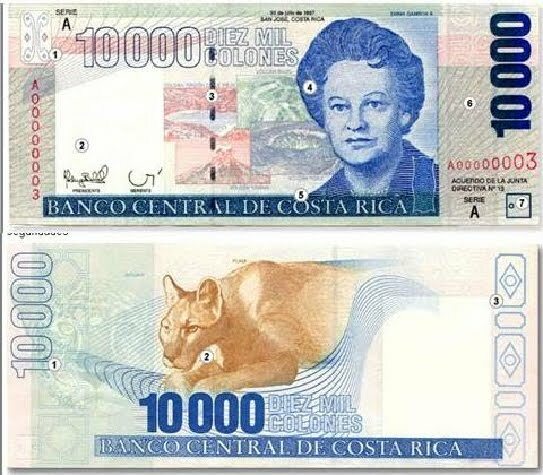 New currency will also include a ₡20,000 and ₡50,000 bill. *Money on course? Students can bring money with them, but it will be kept in the Valuables Lockers while the students are on course. The only access to the money they will have is on their City Tour day when they will go to an Artisan Market and grocery store for local souvenirs. *Exchange money? Exchanging US dollars to local Costa Rica colones is not necessary - larger stores and souvenir markets accept USD. Major credit cards are also accepted (although the outdoor artisan markets charge a small fee to use a credit card). *How much to bring? Bring enough money for the $26 Exit Fee at the airport. Most sizeable souvenirs cost between $10 and $20, and our sweatshirts cost $20. Along with stunning beaches and diverse rainforest ecosystems, Costa Rica is also home to volcanoes. Lots of volcanoes. There are over 200 identifiable volcanic formations, with only around 100 that show any signs of volcanic activity. And only five are classified as active volcanoes. Most of the volcanoes in Costa Rica lie in the northern part of the country and in the Central Highlands. Volcan Rincón de la Vieja is another popular volcano day trip, but it offers much more than one can see in a day. Rincón de la Vieja National Park contains miles of hiking trails (including a challenging 8 km. climb to the crater) in addition to natural hot springs, waterfalls, bubbling mud pots, swimming holes, and camping! 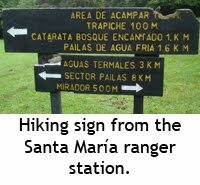 There are two ranger stations in the park, Las Paílas and Santa María. Camping is only available at Santa María, the campsites at Las Paílas were closed in 2008 (some guidebooks still mistakenly say that there is camping available- there isn´t!). The two ranger stations (puestos) are connected by an 8 km trail. The main draw to Santa María are the campsites which come equipped with potable water, flushing toilets, and showers. Just remember to bring in your camping gear and all food and cooking supplies. 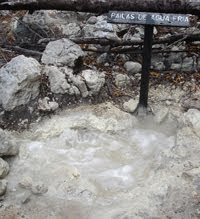 The other advantage to the Santa María station is the proximity to the hot springs (aguas termales). A 3 km hike brings you to clear, blue pool of HOT blue water. Other hikes bring you to some small waterfalls and bubbling mud pots (paílas). You can leave early to hike to Las Paílas and see the sights around that ranger station. Most visitors to the park enter at Las Paílas. There is a common 4 km loop that goes by numerous mud pots as well as a large waterfall. A beautiful swimming hole is located 1 km from the ranger station. Two waterfalls are located further from the ranger station, a 5 km. hike takes you to La Cangreja, a high waterfall with a swimmable pool at the bottom. If you are interested in the crater hike, you must begin early! The hike is 8 km. each way (16 km. total), and the trail is often closed due to poor visibility. Aside from camping at Santa María, there are other nearby accommodations. There are numerous lodges, I´m also told that the Rinconcito Lodge offers camping (and is walking distance from the park). Dry season (December-April) is the ideal time to visit Rincón de la Vieja for numerous reasons, including visibility and transportation. The crater hike is often closed in the rainy season because it is too cloudy. The access road to Santa María also gets very muddy( I had to walk the final kilometer to the ranger station when I visited in June). However, this is all doable in the rainy season, just be prepared with rain gear. It’s been said that knowledge is of no value unless you put it into practice. When it comes to putting knowledge of wilderness survival into practice, few do it better than Les Stroud. Stroud was the host of the popular Discovery Channel program, Survivorman, and is also a filmmaker, outdoor adventurer, singer/songwriter and author. And it is his book, Survive! Essential Skills and Tactics to Get You Out of Anywhere – Alive, that Costa Rica Outward Bound will use this summer when it runs its very first Jungle Survival Course from July 17 through August 9. 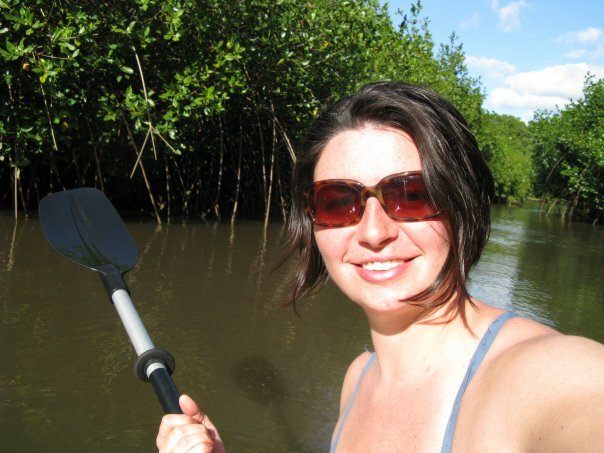 Stroud’s book covers a wide range of topics for a wide range of environments – including the rainforest. Chapters cover areas including trip planning and preparation, acquiring essential resources such as water, fire, food and shelter, and the psychological aspects of survival. The easy-to-read text is peppered with engaging anecdotes, illustrative photos, as well as a host of very practical tips for staying healthy and safe in extreme conditions. Lessons from the book – along with the local knowledge of our Tico instructors – will be taught throughout the Jungle Survival Course. Students will learn a range of practical survival skills including building a shelter from available materials, fire starting, finding drinkable water, and First Aid. But it’s not all about survival. After all, this is still Costa Rica Outward Bound. The course spans an adventure-packed 24 days including rafting, surfing, hiking, staying with indigenous families exploring volcanoes and participating in a service project. This mix of fun and wilderness survival will be more than carried out by what Scott (our Associate Program Director) calls, "The Power Pair." He's talking about Orlando Zamora (center photo) and Lisa Purul (photo on right). Orlando is arguably the most knowledgeable Tico when it comes to Costa Rica, the flora and fauna, and the environment in general. Simply put, he's our very own Tico MacGyver. And Lisa, well, let's just say she graduated from the United States Air Force Academy and won both the Tallahassee Marathon and the Great Floridian Ironman. Survivorman (photo on left) may have a lot of knowledge to impart to Costa Rica Outward Bound, but Orlando and Lisa have a combined expertise level to disorient Mr. Survivor himself. And by "finally," we mean six months of discussions, office meetings, visits by Carlos Vargas (our spirited and devoted Tico t-shirt distributor), visits to the fabric factories, and long-distance communication with Kat Lusher (the designer) in San Francisco, California. Yes, it's been a long time since the day Debbie, our Marketing Coordinator, frantically informed us, "we need to order more shirts!" last December. As you can see, we are all pretty excited about our trendy new look. Cheesy? Yes. Comfy? Definitely. For Sale? Of course! The cost of $15 covers international shipping and credit card fees. Send your shipping address and the credit card authorization form to alumni@crrobs.org. Unlike large tuition payments, you do not need to send us copies of your credit card and ID. A big "Gracias" goes out to the Communications Office, Carlos Vargas, Esther Garcia (ou accountant who had to deal with a lot of confusing quotes and prices), and especially to Kat Lusher (who also designed a new logo for us)! Photos taken on June 14, 2010 when much of the staff was around base preparing for busy season to start. Back row, left to right: Carola (Instructor), Ana Maria (Instructor), Alexandra (Instructor), Debbie (Communications Office), Shawn (Communications Office), Santiago (Instructor), Donna (Instructor), Orlando (Instructor), Antonio (Instructor and Logistics Manager). 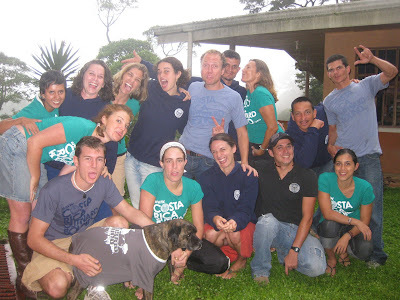 Front row, left to right: Elizabeth (Communications Office), Scott (Programming Office), Bandido (base mascot), Laura (Programming Office), Maggie (Communications Office), Danny (Instructor and Logistics), Manuela (Instructor). "A very fun, challenging, educational and exciting adventure." 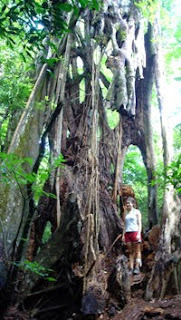 "I really loved seeing all the different wildlife -- snakes, alligators, toucans, parrots, monkeys. I also really like the homestay with Santiago and his family; I thought that it was one of the most valuable things I've ever experienced." 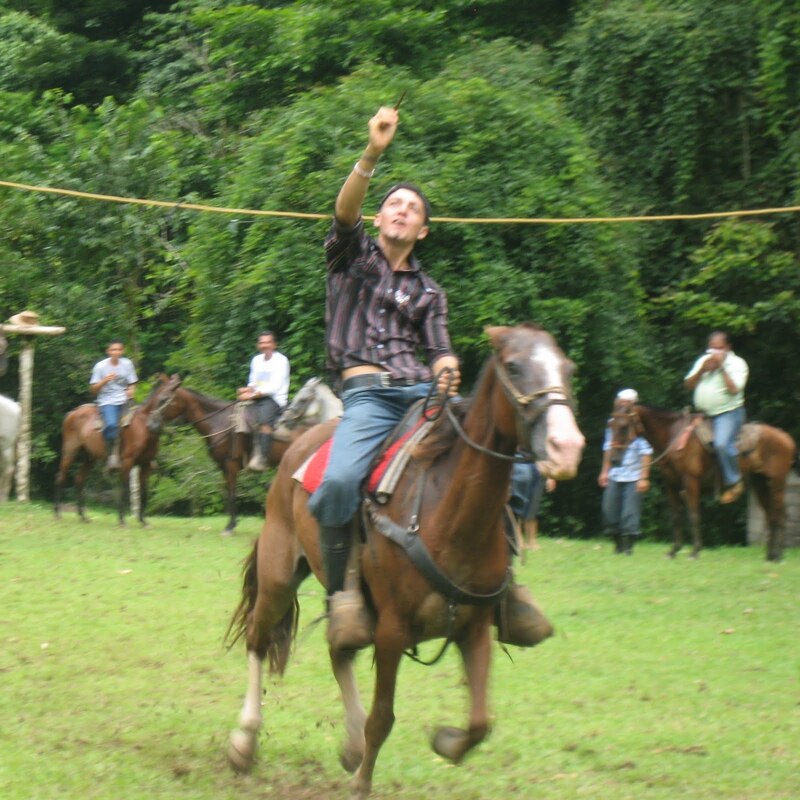 "The Tinamu Ranch experience was fantastic." 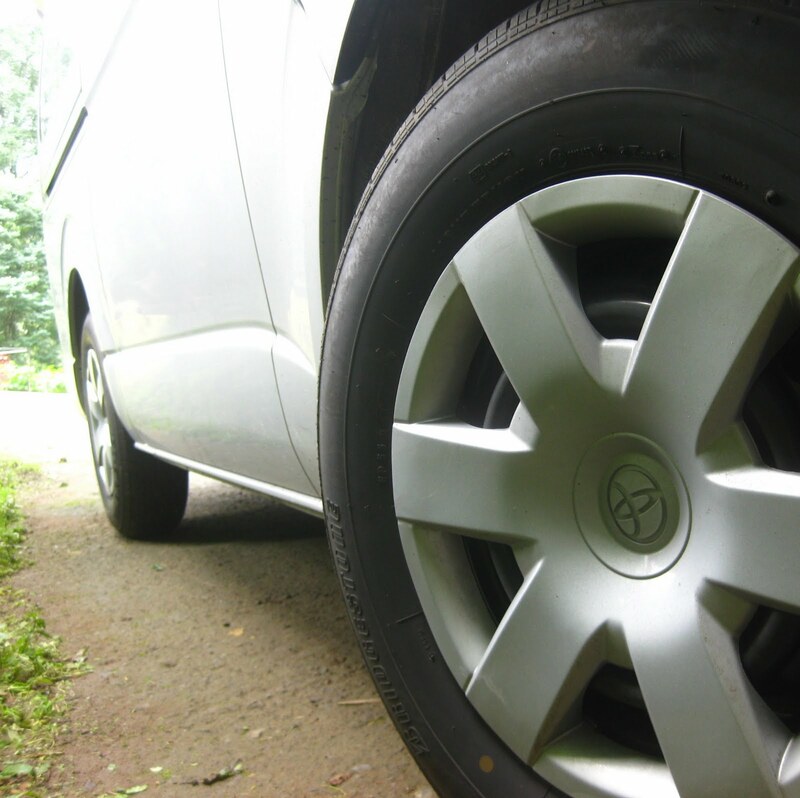 "I would recommend it to anyone for a new challenging experience." "It was an incredible experience in which I was able to grow closer to my classmates and immerse myself in Costa Rican culture." "[My positive highlight was] the feeling of accomplishment." 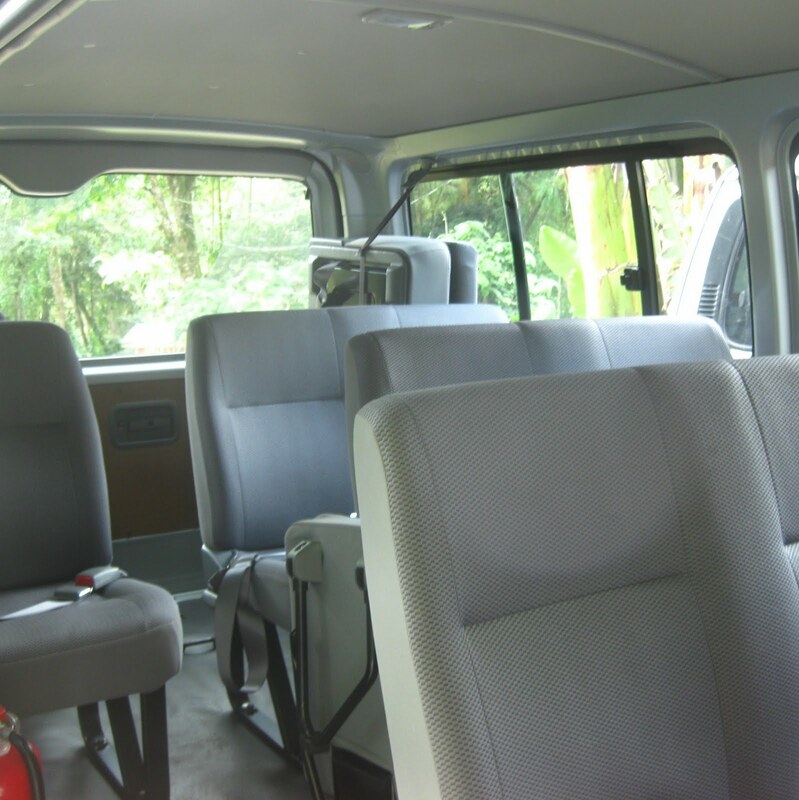 "I would recommend CRROBS to any of my friends and family because the rainforest is AWESOME!" "It was the adventure of a lifetime." 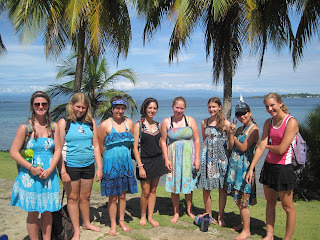 Not only are the eight Girl Scouts (arriving on Monday) coming to Costa Rica as our first course of our infamous "Busy Season," but they are also the premier group for our Underwater Explorers course. 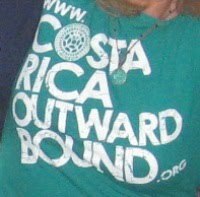 Costa Rica Outward Bound has run courses similar to UE's Costa Rica phase (including hiking, homestays, service and rafting) and other courses similar to its Panama phase (including sailing, scuba diving, and wakeboarding), but they've never been combined for one of our Girl Scouts Destination* courses. Who better to lead these fine young women into new challenges than veteran instructor, Donna White, and two of our newest - and highly skilled - female instructors, Mariana and Erin? About: While she can be tough on her students (for their own good, of course), nobody can help ending a conversation with "Yes, Donna. You're right." It must be that adorable southern accent. That, and Donna has a lot of experience and skills in a multitude of areas. She has fixed up boats, cooked in a sorority house, led yoga, and helped out friends at fundraisers such as a crepe chef extraordinaire at festivals. About: Mariana's younger sister (and fellow Girl Scout), Alexandra, actually found Costa Rica Outward Bound first when she came on one of our Catching Waves courses last year (and will be here again this summer for the third Underwater Explorers course). 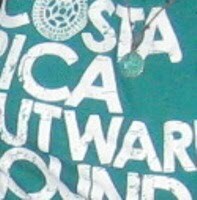 Nevertheless, Mariana was made for leading Girl Scouts in the water with us in Costa Rica. Not only did she grew up in a bilingual Spanish/English home and swim competitively for 10 years with USA Swimming Association, but Mariana achieved her Girl Scouts of America Gold, Silver and Leadership Awards. There are a few more interesting things to ask her about when you come to spend 15 days with her: she has lifeguarded, worked as a Watersports Youth Counselor, knows American Sign Language, and came here straight from Norway where she was an Au Pair! About: Erin has been living a leader's life in her professional years making her more than ready to be one of our new instructors here in Costa Rica. She has worked with youth in many different roles, including work as a Youth Specialist in the Division of Youth Services of Missouri, as a Course Facilitator at Leadership Ranch, and even as an instructor with one of our fellow OB charter schools, Thompson Island Outward Bound. And in addition to helping youth, she can't get enough of the outdoors. 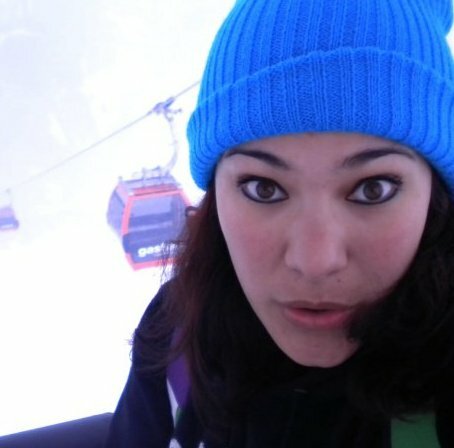 Bienvenida, chica! University of Alabama students wouldn't have guessed any of their days to end to the tune of "Yankee Doodle" when they came here in May as part of their Alabama Action Abroad program. But before bed one evening, as the nightly meeting was coming to an end, the Cacique cued AJ Collins, the Hanashita, to read his account of the day's activities. To their surprise, he cleared his throat, and began singing "Yankee Gringos* Came to Town." Couldn't have sang it better ourselves. With the name "Teton Science School" you might be wondering how it is different from any other school (aside from an extra science class or two) and what it has to do with a "journey." To better understand the connection, it helps to know a few things. First, four of the subjects emphasized in the high school curriculum are Science - obviously - Physical Education, "Journeys", and Spanish. Secondly, through all classes, teachers incorporate both content and skill. The mission statement, in fact, is "Connecting People, Nature, Place and Education through Six Innovative Programs in One Amazing Place." One of these "innovative programs" is the Journeys School, the Pre-K to 12th grade branch of Teton Science Schools. Finally, in setting up the school this way, the goal is to combine innovative content with the traditional disciplines in order to "develop the wisdom to make educated decisions while maintaining a unique perspective of the world." Journeys School does what it can to integrate learning with ecology, culture and the community wherever possible. Therefore, it only makes sense that they would organize a special course for their students with Costa Rica Outward Bound to learn by immersing themselves in this dynamic environment. Costa Rica does, afterall, contain 5% of the world's biodiversity even though it is only about 0.25% of the world's landmass! Around 25% of the country's land area is in protected national parks and protected areas, which is the largest percentage of protected areas in the world. 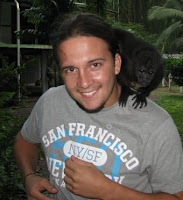 About: Due to his role as a biologist (and the Owner) at Refugio Herpetologico de Costa Rica since January 2002, it only makes sense that he help lead a science-based course. He maintains a collection of 30 species of reptiles and amphibians and investigates at-risk animal populations in Costa Rica. About: Mauren is one of our toughest female instructors. She is known as "Mau" by her friends, and she got married last year to another adventure guide. One of her surprising passions includes watching free-style motocross. When she's not instructing courses, she enjoys playing soccer with locals in her town. This week, the students of Journeys School have already been hiking in the depths of the rainforest through Las Rejas, Cruce Tonito, Rancho Tinamu, and Londres. They have learned about birds, ecology & diversity, insects, and water analysis at Rodolfo's refuge. 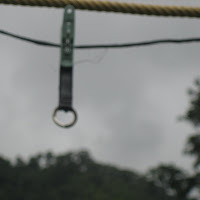 And finally, they will zip-line in the rainforest's upper canopy on Saturday before flying home on Sunday.